Tracheal resection and primary reanastomosis for tracheal tumors and stenosis is a well-described procedure. [1, 2, 3, 4] It is most commonly indicated for postintubation lesions but is also performed for malignancies, secondary tracheal tumors, and tracheoesophageal and tracheal innominate fistulas. Approximately half of the trachea can be safely removed with a low incidence of anastomotic complications. [2, 3, 4, 5] Because of the lack of suitable replacement material for the trachea, various mobilization and release maneuvers have been demonstrated to increase the length of the tracheal resection by elevating the carina. These include hilar, suprahyoid, and suprathyroid laryngeal release [2, 6, 7] ; anterior and posterior digital tracheal dissection; and constant neck flexion. This resected tracheal segment shows internal and external changes that were secondary to prolonged endotracheal intubation. 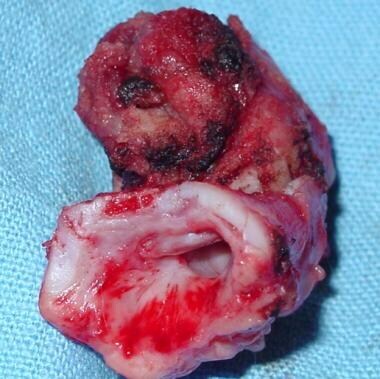 This photo shows a resected tracheal segment (same segment as in the previous image). 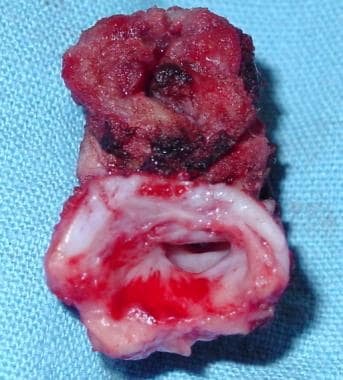 This resected tracheal segment shows ulceration of the mucosa and cartilage, granulation tissue, and fibrous tissue. The trachea is nearly but not quite cylindrical and is flattened posteriorly. In cross-section, it is D-shaped, with incomplete cartilaginous rings anteriorly and laterally, and a straight membranous wall posteriorly. The trachea measures about 11 cm in length and is chondromembranous. This structure starts from the inferior part of the larynx (cricoid cartilage) in the neck, opposite C6, and extends to the intervertebral disk between T4 and T5 in the thorax, where it divides at the carina into the right and left bronchi. For more information about the relevant anatomy, see Trachea Anatomy. Mathisen DJ. Tracheal Resection and Reconstruction: How I Teach It. Ann Thorac Surg. 2017 Apr. 103 (4):1043-1048. [Medline]. Liberman M, Mathisen DJ. Surgical anatomy of the trachea and techniques of resection and reconstruction. Shields TW, LoCicero J III, Reed CE, Feins RH, eds. General Thoracic Surgery. 7th ed. Philadelphia: Lippincott Williams & Wilkins; 2009. Vol 1: 955-66. Rea F, Zuin A. Tracheal resection and reconstruction for malignant disease. J Thorac Dis. 2016 Mar. 8 (Suppl 2):S148-52. [Medline]. [Full Text]. Allen MS. Surgery of the Trachea. Korean J Thorac Cardiovasc Surg. 2015 Aug. 48 (4):231-7. [Medline]. [Full Text]. Mohsen T, Abou Zeid A, Abdelfattah I, Mosleh M, Adel W, Helal A. Outcome after long-segment tracheal resection: study of 52 cases. Eur J Cardiothorac Surg. 2018 Jan 16. [Medline]. Montgomery WW. The surgical management of supraglottic and subglottic stenosis. Ann Otol Rhinol Laryngol. 1968 Jun. 77 (3):534-46. [Medline]. Dedo HH, Fishman NH. Laryngeal release and sleeve resection for tracheal stenosis. Ann Otol Rhinol Laryngol. 1969 Apr. 78 (2):285-96. [Medline]. Mueller DK, Becker J, Schell SK, Karamchandani KM, Munns JR, Jaquet B. An alternative method of neck flexion after tracheal resection. Ann Thorac Surg. 2004 Aug. 78 (2):720-1. [Medline]. Karapolat S, Turkyilmaz A, Seyis KN, Tekinbas C. A Comfortable Solution To Tracheal Anastomosis Protection: Tracheal Retention Sutures. Heart Lung Circ. 2018 Apr. 27 (4):e39-e41. [Medline]. Hung WH, Chen HC, Huang CL, Wang BY. Thoracoscopic Tracheal Resection and Reconstruction with Single-Incision Method. Ann Thorac Surg. 2018 Mar 3. [Medline]. 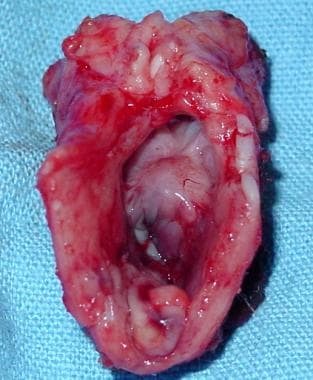 Jiao W, Zhu D, Cheng Z, Zhao Y. Thoracoscopic tracheal resection and reconstruction for adenoid cystic carcinoma. Ann Thorac Surg. 2015 Jan. 99 (1):e15-7. [Medline]. Piazza C, Del Bon F, Barbieri D, Grazioli P, Paderno A, Perotti P, et al. Tracheal and Crico-Tracheal Resection and Anastomosis for Malignancies Involving the Thyroid Gland and the Airway. Ann Otol Rhinol Laryngol. 2016 Feb. 125 (2):97-104. [Medline]. Grillo HC. Development of tracheal surgery: a historical review. Part 2: Treatment of tracheal diseases. Ann Thorac Surg. 2003 Mar. 75 (3):1039-47. [Medline]. Carinal resection. CTSNet. Available at https://www.ctsnet.org/article/carinal-resection. July 1, 2008; Accessed: March 7, 2018. Villanueva C, Milder D, Manganas C. Peripheral Cardiopulmonary Bypass under Local Anaesthesia for Tracheal Tumour Resection. Heart Lung Circ. 2015 Jul. 24 (7):e86-8. [Medline]. Grillo HC. Development of tracheal surgery: a historical review. Part 1: Techniques of tracheal surgery. Ann Thorac Surg. 2003 Feb. 75 (2):610-9. [Medline]. Tracheal resection part 1a. Video courtesy of Dr Mueller.